Ben Holyk’s new book of historic photographs arrived today. 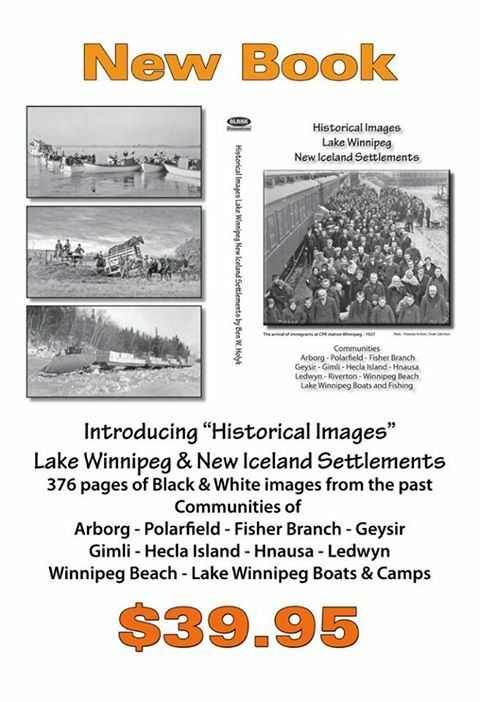 It is called “Historical Images Lake Winnipeg New Iceland Settlements”. It covers more communities than usual: Arborg, Poplarfield, Fisher branch, Geysir, Gimli, Hecla Island, Hnausa, Ledwyn, Riverton, Winnipeg Beach. As well, it has a section on Lake Winnipeg Boats and Fishing. It is 376 pages and is crammed with pictures, many of which I have not previously seen. I have read a fair amount about New Iceland, its people and places, the boats of Lake Winnipeg, the buildings, the farms but I’ve had to imagine what they looked like. Now, I have images for many of those people and places. I’m happy to have a picture of the S.S.Colville, the ship that brought Icelanders to New Iceland but also a picture of an oxen team that was used in Arborg. Pictures of Ragnheidur and Oscar Einarsson on their wedding day in 1914 and Sveinbjorg and Nikulas Halldorson provide a good idea of how people dressed. Dr. J. P. Palsson and his wife Sigudur in 1910, are fashion plates and one cannot help but wonder how their clothes were kept clean. No automatic washing machines. As far as I know, tubs and scrub boards and, if you could afford it, hired help were required to keep a person presentable. Logging camps had bad reputations for the way they treated the men who worked for them. The work was hard, the pay low, the isolation complete and accommodation? Well, the picture of the logging camp north of Arborg provides a good idea of how loggers lived. Wood, in the early days, was used for heating and cooking plus fueling the steam ships. It created a cordwood economy. It’s hard to imagine the amount of wood needed to fuel the local houses and the houses and businesses of Winnipeg. A sense of that can be seen in the picture of Chapil’s horse team hauling logs to the Arborg railway station, 1940. One of the surprises in the book is provided by the pictures of Fisher Branch. There’s a general view taken in 1907 and a picture of the St. Nicholas Ukrainian Catholic Church that was built in 1913. The Fisher Branch Creamery’s fleet of delivery vehicles is impressive. I count six nice looking cars. The Ukrainian Farmer’s Co-op store with its employees outside (I count 34) gives a sense of a thriving community. Trains arrived in 1914 and continued until 1980. Geysir has always had a reputation many times its actually size. My impression of it has been of a dance hall (picture included), a church and a graveyard but Ben’s pictures show pictures of quite elaborate churches, St. Nicholas Ukrainian Catholic church (1913), Immaculate Conception RC church (1912) and Geysir Evangelical Lutheran Church (1928). There are pictures of the Geysir school, the students and staff, the men’s baseball team (baseball, when I was a boy in the 1940s was taken quite seriously), a threshing outfit and a rather amazing picture of J.K.B. Jonson hauling hay from Fisher Bay for Baldi Halldorson. Gimli, as usual, takes up a good part of the book, mostly because people came there On holidays and took pictures. I see that at least one of them is credited to my great aunt Stina Johnson but others that I believe she took, are not. The picture of a Manitoba steam side paddler docking at Gimli in the 1910s gives me an image of what life was like in the 1910s that I never expected. My great grandfather’s store at the corner of Main & Centre in 1905 is displayed. It’s an often used photo and will be familiar to many. There’s a picture of the H.P. Tergesen house in 1906 when it sat on open land waiting for the town to be built around it. I was happy to see a picture of the Lutheran church with its spire. There’s a picture of “Beaver House, the Lake View hotel and Lyric Theatre taken sometime in the 1900s. There are some fine pictures of campers’ cottages. I just wish that the locations were included. Many of the early cottages have been torn down and replaced with permanent houses. I was pleased to see a picture of Bjarnason’s grocery and dry goods store because no one except me seems to remember it. There’s a picture of the original Johnson Memorial Hospital that opened in January 28, 1939, just a few months too late for me to be born there. I’ve always regretted that and thought my mother could have waited or they could have finished the hospital sooner. Hecla has been a storied place mostly because it is an island. Before the bridge was built from the mainland, access was by boat or ferry (picture included) and, during break up and freeze up, the people were isolated and left on their own to survive as best they could. As harsh as conditions were in the beginning, the local people built Hecla’s first school in 1890 and there is a picture of it. What are amazing are the pictures of Reynistaour and the Tomasson Boarding house. There’s a picture of the Sigurgeirsson log house that served as a store and post office. There are pictures of a cat bringing logs from the north on five sleighs. Since I’ve read Glenn Sigurdson’s manuscript about his family’s role in the fishing industry, I know about the house and store that Stefan Sigurdsson built. However, I’d never seen a picture of them. Fortunately, there is such a picture and it fills me with amazement for who would think such elaborate and large buildings would be built in a small community on the shore of Lake Winnipeg? Most people have forgotten, if they ever knew, but Hnausa held its own Islendingadagurinn in competition with Gimli. There are pictures of the celebration at Hnausa Park in 1932 and of the Fjallkona. There’s an excellent picture of winter freighting with a list of the men in the picture. Some are sitting on top of a sleigh of fish boxes and others lined up in front. There’s even a picture of their mobile home being pulled by two horses. If Hnausa has been ignored in articles about New Iceland, Ledwyn has been cast into outer darkness. It’s wonderful that Ben has included Ledwyn. While there are Andersons and Arnasons among the pictures of the first settlers of Ledwyn, most of them are of Andrushankos, Bachynskis, Bonkowskis, Dziadykewiczs, Furgalas. These people don’t fit into the normal myth of New Iceland. However, they were every bit as much a part of New Iceland as the Icelanders. There are pictures of the catholic churches, of the Zinkowski store, of the Polish Hall, the community hall (where I had wonderful, memorable times) of the Ledwyn Band. There is a picture of school students that were taught by Peter and Mary Onysko. In 1961, Peter was the principal at Riverton and I was in my first year of teaching. Riverton was supposed to be the capital of New Iceland but bad weather meant the barges carrying the settlers were cut loose and drifted to shore at Willow Point. Settlers moved north to settle along the lake shore. I found Ben’s description of the settlement of what was called Lundi, then Icelandic River and, finally, Riverton, unclear. I know the story, or at least some of it, but if I didn’t, I’d be confused. It’s good that he adds in the Ukrainian settlers, the Hungarians, and the Mennonites but the local aboriginal people get short shrift even though they were very much part of the community. There are many pictures including some early ones of the bridges that joined the two sides of Riverton. The Sigurdsson and Thorvaldson store gives a good example of prairie buildings. There are pictures of farm houses that became well known such as Bakka, Straumnee, Akri, Loni and Unaland. There’s a fine picture of Gunnsteinn Eyjolfsson’s threshing outfit at Unaland and a number of pictures of the freight trains that travelled over the lake in winter. Riverton has always been known for its music and it is great that there is a picture of the Whiskey Jacks with an amazingly young group of musicians including my friend, Dennis Olson. There is a little bit of everything from Riverton Game & Fish Target Practise (people did shoot their dinner) and the Reggie Leach Night at the Riverton Hall (Reggie is called the Riverton Rifle but his rifle was his hockey stick and his bullet the puck). I’ve never thought of Winnipeg Beach as being part of New Iceland but it was a big part of our life during the summer. We lived in anticipation of our parents taking us there for the day. It was the Coney Island of New Iceland, even of Manitoba. Speculators saw a chance to make a lot of money selling lots at Winnipeg Beach for cottages. Therefore, the railway got pushed through to Winnipeg Beach. There’s a picture from 1903 with sailboats and tourists. The railway brought people by the thousands to ride on the ferris wheel, the roller coaster, to dance at the dance palace, to stay at the Empress Hotel. To buy lots and build cottages. The CPR wasn’t missing any tricks when it came to making a buck. The astounding thing about these pictures and those in the book on the history of Winnipeg Beach is the contrast between the well to do who came to the Beach and the ordinary local people who were struggling to make a dollar. The Dance palace was one of the largest in Western Canada at 14,000 sq. ft. The picture that shows the boardwalk that fronted the beach and the shops where visitors could play games of chance makes clear just how fashionably dressed the visitors were. I’m very pleased that Ben included the last section on Lake Winnipeg for while it was not a community in the sense of the towns and villages, it was still a community. It was spread all over the lake but it had its own identity. There are welcome pictures of the various freight boats plus pictures of how skiffs were towed out to the fishing grounds by the freighters. There are some pictures of the fishermen. However, the Lake Winnipeg fishery was large and has gone on for generations. It really deserves a book of its own. This book would have benefited from an editor going over it for small details. There’s the occasional world spelled incorrectly and, in places, I thought some minor points were incorrect or, at least, confusing. However, this is not a book of text. It’s a book of pictures. It is a book that once bought, should be kept and if any corrections or additions are needed, the owner can put them in by hand. I wish this book had been published when my father was still alive. I’d have looked it over with him and added numerous notes in the margins about the places and people he knew. He spent a life time on Lake Winnipeg and in New Iceland and this book would have stirred many memories and stories. If you grew up in New Iceland, this is a must book for your book shelf. It’s a book to share with friends and family. It can be ordered from Ben W. Holyk, Box 1316, Stonewall, MB R0C A20 for 39.95 plus shipping. His web page is BLAKK.com, email: blkholyk@mts.net. Once, they were myriad. You found them everywhere. Icelanders having kaffi and kleinar, passionately discussing politics or religion, reciting poetry, the state of the crops, the weather. All of it, of course, in Icelandic. 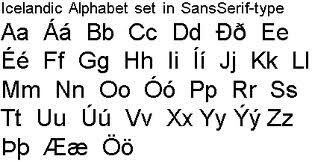 That sing song language was heard in stores, on streets, in homes. At first, of course, it was the original settlers who began to disappear into places like Brookside cemetery. Go to the cemetery and you will find gravestones with Icelandic names. My father’s great grandparents, for example. Lutheran ministers, business people, housewives with names like Ingimundson, Johnson, Thidriksson, Albertson. Over the decades, their children grew up, then joined them, carried away from Lutheran and Unitarian churches to small plots of ground. Tears and prayers marked their passing. And kaffi and ponokokkur . We have given up Viking funerals and burning boats floating from the shore, replaced it with quiet conversations, the clanking of coffee cups, the eating of sandwiches and sweets. The Icelandic service is now in English. The conversation in the reception room is nearly all in English. Here and there a small group talks Icelandic. However, as amazing as it seems, some of that second generation have lived, are still live, among us. A few days ago, one of them, born GUDLAUG ADALHEIDUR OLAFSSON but affectionately called Lauga, died in the nursing home at Selkirk. She was just about 99. 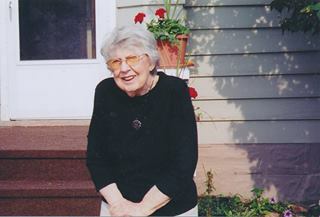 Born in 1914, the year WWI started, she was born on a grain and cattle farm in the small Icelandic settlers community near Sinclair, Manitoba, the daughter of Thorgrimur Olafsson from Borganes, Iceland and Gudrun Rosa Thorsteinsdottir from Leira, Iceland. The farm actually straddled the Manitoba/Saskatchewan border. Lauga had a phenomenal memory. She was the Wicki of West End Winnipeg. Mention an Icelandic name and she could tell you their genealogy plus their life stories. She also remembered her childhood clearly. She described going to town, collecting the cheque for the cream, threshing, the rituals of funerals, much of it nine decades gone. Every afternoon at four o’clock, she had coffee and chocolate and it was during this time, at the kitchen table that I heard her stories. It was she who, having worked as a mother’s helper after her father could no longer afford to send her to the Jon Bjarnason Academy in Winnipeg, explained to me that there was an error in my children’s picture book, Sarah and the People of Sand River. In the book Sarah had her own bedroom. Lauga said that wouldn’t have happened. Every bedroom would have been in use. As a servant girl, Sarah would have slept on a cot in the kitchen. Times were hard when she was growing up. There were times of prosperity but those were followed by recessions and even depressions. She lived through the Great Depression. She proudly told of how the local Icelandic community held bridge evenings to raise money for people who could not afford to buy coal. In Winnipeg, in winter, fuel is necessary for survival. She also liked to tell about how individuals who were better off took clothes and food to those who were having a difficult time. Lauga was, without doubt, one of the most interesting people I’ve ever met. I liked her enormously. The greatest compliment I can give her is that I wish I’d met her earlier, known her longer. I’d have heard more stories, learned more of the details of what it was like being part of a pioneering Icelandic family in rural Manitoba. When she told her story of her shoes being burned fighting a prairie fire and having to wrap her feet in rags until there was enough money to pay for a new pair (money from a bounty on gopher tails), you knew you were listening to reality. In the writing of fiction, we call those clincher details. Lauga was a fount of clincher details. Listening to her over coffee, I would think to myself, I couldn’t have made that up. As a community, we are proud of the fact that some of our members still speak Icelandic. Lauga and her husband, Agnar, both spoke Icelandic. Agnar taught at the fabled Jon Bjarnason Academy, a private academy in Winnipeg that taught Icelandic among its other subjects. Agnar died in 1996. He was a gold medalist in Mathematics and Latin. He was a chess champion. He had lots of choices for a wife. He chose Lauga. Because of illness and because of the Depression, she wasn’t able to complete her formal education but she had learned to read Icelandic at the age of three. She read widely and well in both Icelandic and English. She loved literature. It was her copy of Independent People that I first started reading. She was a good match for a gold medalist and chess champion. She, like many who lived through the 30s and 40s, knew hard times. They didn’t stop her from having dreams. She reminded me in many ways of my Irish grandmother who lived in Winnipeg. She, too, had gone through the Great Depression with all its privations. These two women both discovered how to dress well with limited budgets. Sales at Holt Renfew meant the best of clothes without the highest of prices. Bargain hunting was a survival skill. Luaga loved shoes. Her collection of shoes meant nothing until I heard about the prairie fire and her having no shoes. Then I understood the importance of that closet full of shoes. She loved the West End of Winnipeg. At one time it was an Icelandic enclave. Over the decades she lived there, it gradually lost its Icelandic character as people moved away. However, she stuck with Garfield Street, with her memories of all the people in all the houses where Icelanders had lived. I’ll fly to Winnipeg so I can be at her funeral. During the service, I won’t think lofty thoughts. I’ll think about how a girl from a dirt poor farm in the southwest of Manitoba made a life for herself, raised a family of four daughters, was an intellectual match for a chess champion and was a strong bridge partner, went from sleeping in someone else’s kitchen to her own five bedroom home filled with Icelandic artifacts. I’ll think of fylgjas and white horses that come galloping out of the north presaging blizzards. Four weeks. A long time? A short time? Not enough time? My former colleague, Dave Godfrey (https://www.facebook.com/pages/Godfrey-Brownell-Vineyards/), sent an email to say that having a triple bypass must have been frightening. Shocking, yes. Frightening, no. No time to be frightened. It was a sunny day. All was right with the world. I went to see my GP for a seven minute appointment. It was about something minor, a bashed toe or something. Then he said, how are you doing? And I said, fine, no problems except I’m short of breath carrying groceries up the Rise. It was only worth mentioning because I’m a former rock climber, hiker, folk dancer. 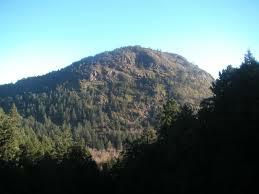 Before I retired, I was walking over Mt. Tolmie and back on my way to work at UVic and home. Although, after retirement, I’d moved, I was still walking up to 2 miles a day. And, I added to the feeling of breathlessness, one time there was this odd pricking feeling on the left side of my chest. “You’ve got my attention,” my GP said and whipped out a form. I said yes to every question he asked. I hate that. I hate saying yes to doctor’s questions. That never leads to sunshine and ponies. I hurtled from him to the cardiologist. This is absurd, I was thinking. I was often walking two miles a day, sometimes further on hilly ground. Nobody, but nobody, with a heart problem could do that. More questions, more saying yes, and I was launched onto a treadmill. And someone shot me up with radioactive waste. I’ll glow in the dark, I thought, promising myself that I’d stand in a closet that night to see if it was true. I grasped the treadmill bar, walked as whips cracked around me, haul that barge, tote that bale, except I couldn’t finish either of the tests and having miserably failed them, I hurtled back into the cardiologist’s office where he said something like your heart isn’t getting enough blood. It’s okay, I thought, I’ll talk to it. I’ve had this heart for seventy-four years. It’s always been reasonable. Except I was launched into the angio department at the hospital and, before I could catch my breath, I was lying on my back, staring at a TV screen. I felt like I was in a medical reality TV show. There was my heart, not that it looked like anything exciting, and a wire moving around like a mouse sniffing for something good to eat. “Looks like a bypass,” someone said. Shortly, someone said he could do a stent but there were problems with that and I said, “Bypass.” And lickety split, I was walking down a corridor with my daughter who had come to take me home. I lay down, slept, got up, met a heart surgeon who drew a diagram that did not look promising. A triple bypass, he said. You need to sign these forms. One for the operation. One for a blood transfusion. Operation in four to six weeks. Somebody greased this slide. I slid into a lawyer’s office to update my POA and my will. I typed up a list of my assets, my possessions and which ones might be worth something if sold at the auction, my passwords for my various accounts, and I walked, walked, walked, 1.2 miles to the mall, 1.2 miles home, around and around Playfair Park. As I circled around Playfair Park one day, I explained to a young woman I’d pulled in behind that I wasn’t following her, I was getting ready for surgery. Nowadays, men of a certain age, who walk behind young women need to justify their behaviour. Especially when they’re walking circles around a park for no good reason. Circles, circles, circles. Little did I know that I should have also have been doing squats because for 12 weeks, I wouldn’t be allowed to bend over. Squats for strong thigh muscles to help me get out of bed without using my arms. Too late we learn these things. Four weeks. A long time? A short time? Not enough time? There were tests. There was trying to get a messy life organized so that if I didn’t make it, I wouldn’t leave a disaster behind. I’d been POA and Executor for my father and mother and even though their estate was simple and straightforward, it was filled with frustration and grief at times. I considered piling up all my manuscripts, correspondence, furniture in the middle of the house and setting it on fire with me in the centre. That way there’d be nothing left except the bank and retirement account. And it would save on a cremation fee. There wasn’t time. JO came from Salt Spring and we raced through the halls of Jubilee hospital into a day long session on the operation and post operation. That evening was a frantic rush to do everything that needed to be done, pills to take, a sterile shower, change for the metres (no situation is without its compelling trivia), clothes packed for post op, then sleep until the alarm at 4:30, no liquid, no food, rocketing through the darkened streets of Victoria to be at the hospital at 5:30. And then it is all a blur, memories driven away by the anaesthetic that erases a chunk of one’s life. JO tells me of things of which I have no memory. She says there was a wonderful nurse. JO walking with me as my bed was rolled to the operating theatre. She says that after the operation, I woke up many times, but I have no memory of these times. When she asked if I was in pain, I apparently pointed to the breathing tube. All I remember is waking up and thinking that I was waiting for the operation, then realizing the operation was over. Shock. JO says that on day two we watched a cartoon movie on the TV for an hour. I remember nothing. Yesterday, she showed me part of the movie on Netflix. Nada. Nothing. It may be because it was a terrible movie. I deliberately forget terrible movies. So, no, no time to be frightened. There was too much happening, too much that had to be done to get ready to die, ready to live. And later, there were the crazy challenges. They’d cut my chest in half with a rotary saw, they’d picked up my heart, checked the back of it, made three bypasses, wired me together and a nurse sat beside me and said, “I’ll help you sit up.” “Next,” she said, “we’ll go for a walk.” And then there was a shower. And painkillers and using a Spirometer and coughing to keep my lungs clear and five days after the operation, climbing a set of stairs and down until I had proved I could go up sixteen stairs but by that time I was less crazy and life was less incoherent with stretches of time connected instead of disjointed. And seven weeks later, the big change is that life has slowed down, has become coherent, one day is connected to the next, and the challenge is to get ready for the treadmill tests on September 25 and hope like hell that the operation has worked and I can finish them. I’ll know the operation worked when I can hike to the top of Mt. Finlayson. I used to climb it every Wednesday, winter and summer, in sun, rain, snow. When I get to the top, I’ll be able to see Finlayson Arm and whether the swans still float like an armada of small white ships on the blue water.